Radio Sure (Radio?Sure!) 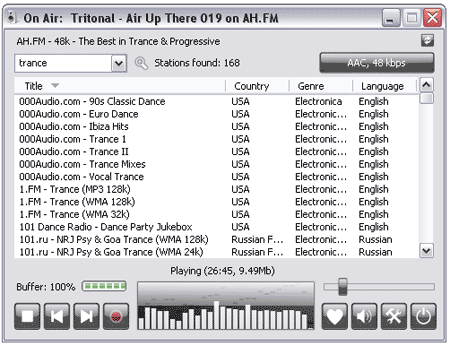 is a Free Portable Internet Radio Player that offers access to (Stream Internet Radio) play songs from Internet Radio Stations. You can also Record Internet Music using an included Internet Radio Recorder and it allows simultaneous recording of multiple stations. Over 12000 radio stations are included with Radio Sure, supporting mp3, wma, ogg vorbis, aac+ playback formats. Other features include; quick search for radio stations, smooth cross faded transitioning between stations, alternate skins available for free or purchase.